I'm wondering if this should go into "Pictures"? This is one that I had wanted to do for a long time and I finally completed it last summer. It was a lot easier to make than it looks and the colours are those that I love. I am so pleased with it! It is covering our bed right now and keeping us toasty during this very cold winter. I have two, but this Fancy Dish Dresden plate resides on my brass bed (not Shown). Jane Stickle is on the living room wall and is my second. 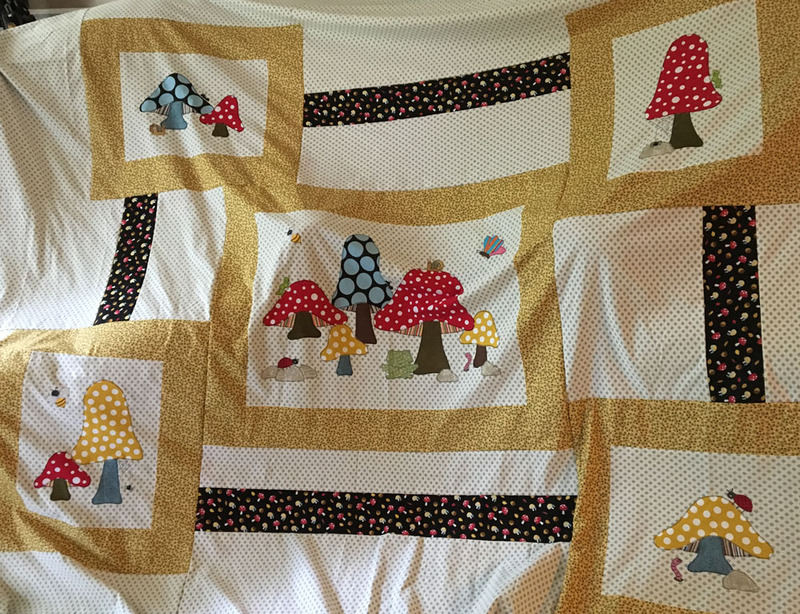 @grma33, can't see or link to your beautiful quilt. These aren't the best pictures, but this was one of my favorites, partly because it took me several years to complete, and partly because I just had so much fun designing all the appliques. I don't even have a photo of the completed quilt! The side with all the B&W pieces is made with scraps from lots of things I've made over the past 40 years. The mushroom side was just for grins. 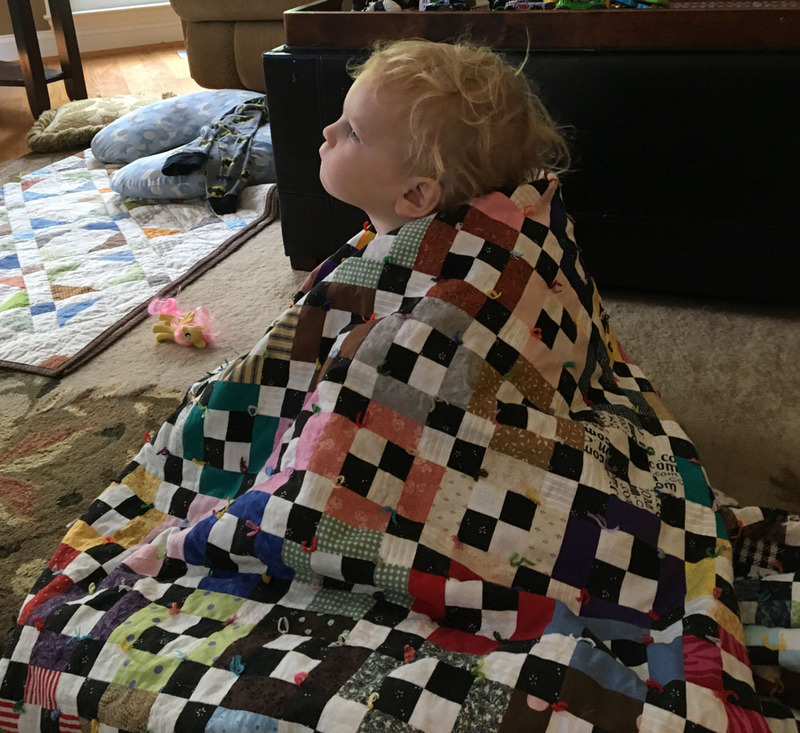 As you can see, my grandson likes it better than the one I made him when he was born (in the background). This is still a top but i love it. 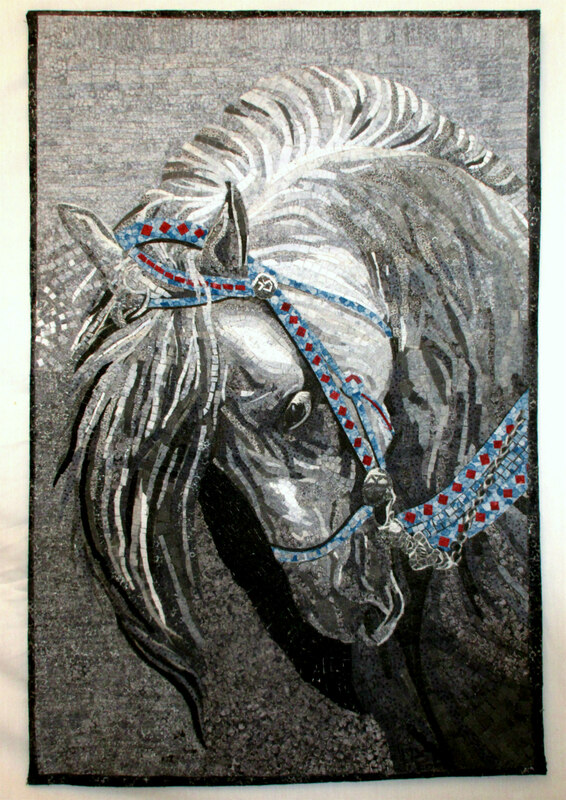 from a McCalls quilt magazine years ago I think. meyert, your DWR is stunningly beautiful. It's one I really would like to make. 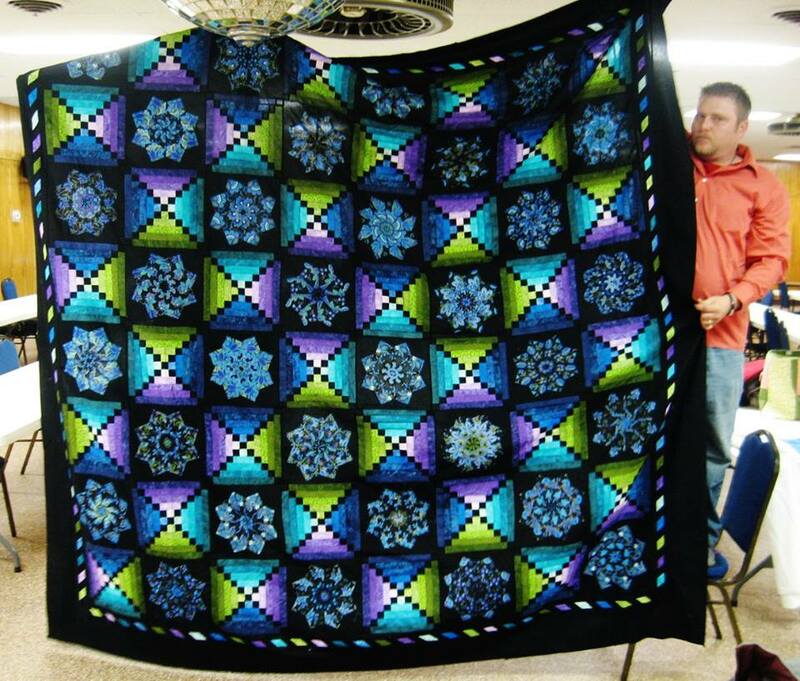 These are all so beautiful quilts. Sailorwoman-love your quilt I guess because I love browns and your quilt is so pretty. 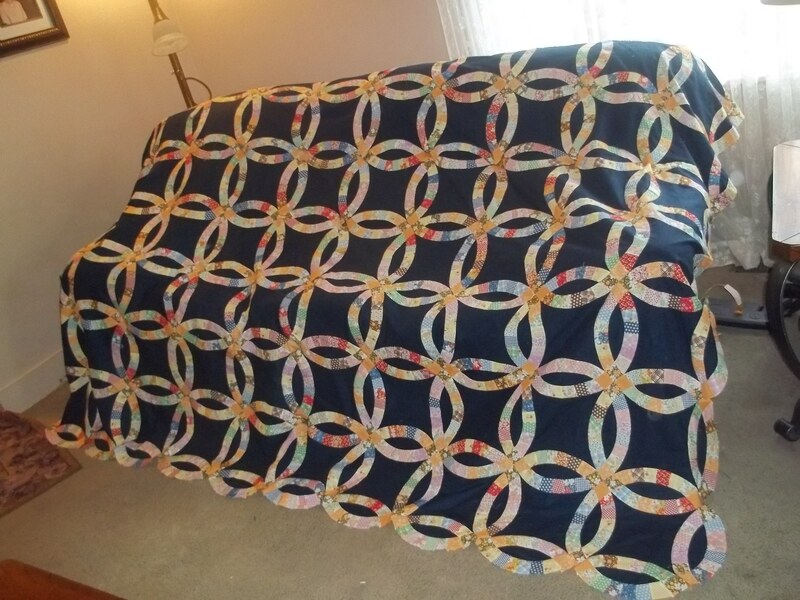 Meyert-especially love your quilt too because when I first started quilting I ask my daughter what pattern of quilt she would like me to make and she said she wanted a wedding ring quilt----YIKES!!!! Well-I purchased the plastic templates from Shar Jorgenson and went to the quilt store and picked out fabrics (with tons of help from the ladies there) and came home and started cutting. I got a pizza box and put all of the cut pieces in that and when I got a few minutes to sew away I went. It was fun but quite tedious. Wish I knew how to put pictures on this board so I could show everyone. 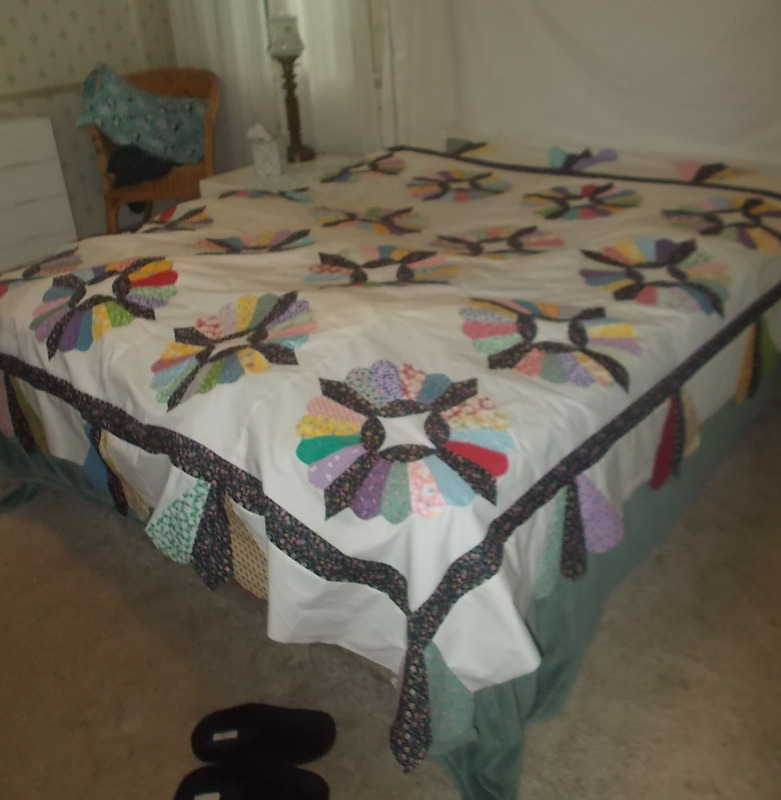 The quilt turned out very nice and I was pleased. I would love to see a picture of yours! Granky - Wow!!! Wow, wow, wow. That is fabulous. Perfect fabric choices. Love the border, too. Have this on my bedroom wall. Enjoy looking at it every day. 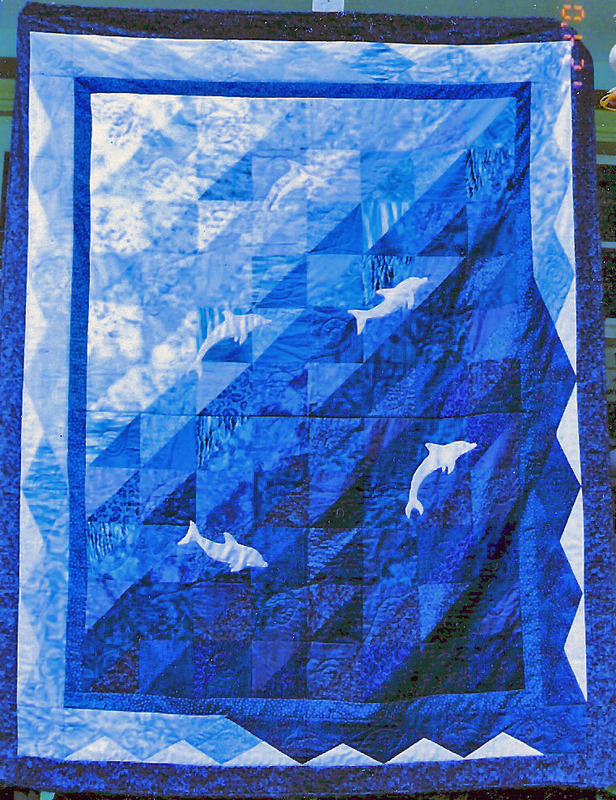 Alishia's Dolphins ~ made in celebration of my niece's graduation. 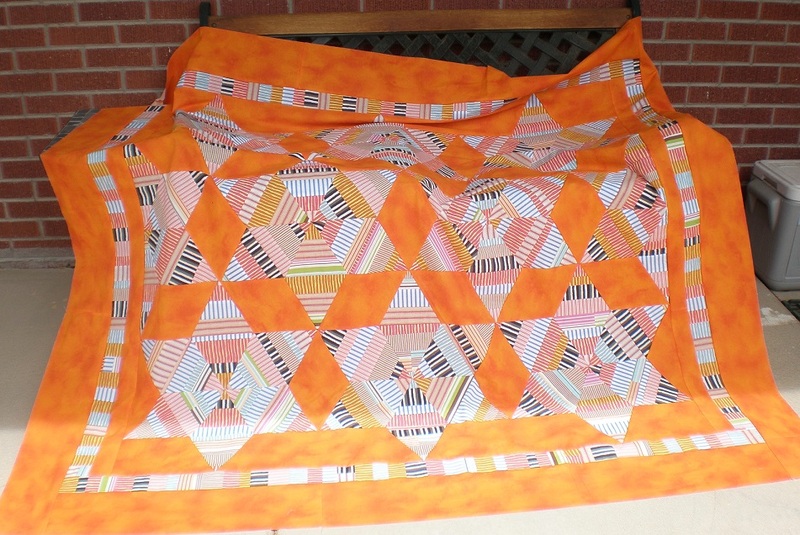 I made 3 major quilts this same year - this one, + another niece's graduation + my Mama's 80th birthday quilt. It was a busy year - but wonderful. Granky holy moly that is absolutely beautiful!! Oh my this post is adding to my bucket list!! 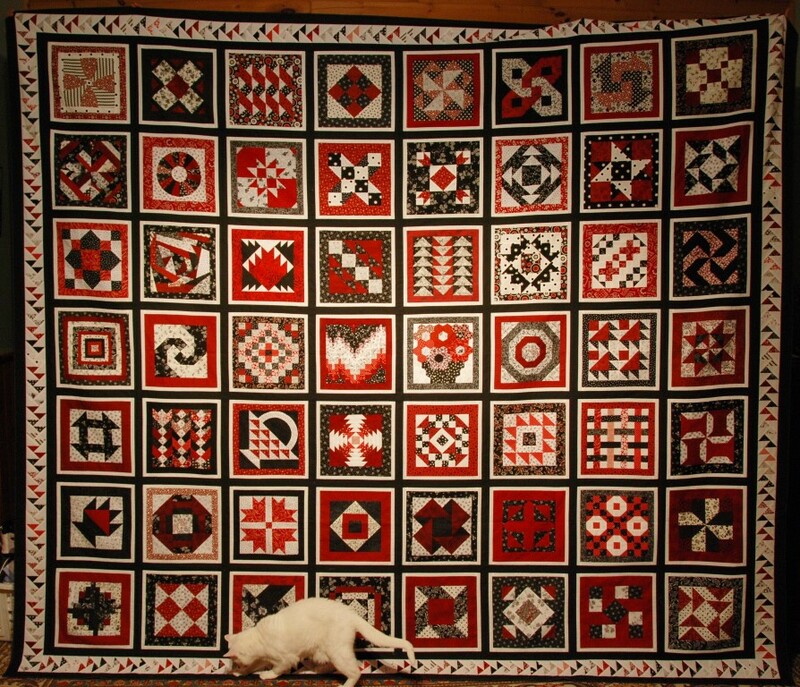 I think my favourite is my black red and white sampler quilt. 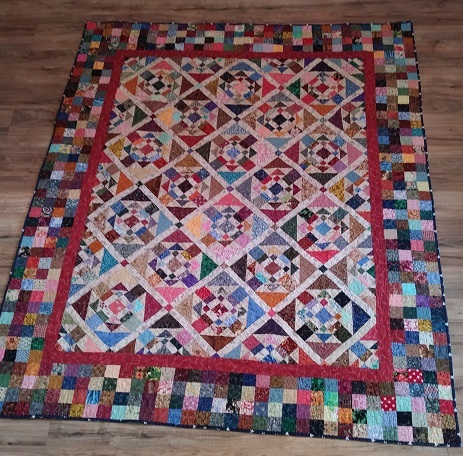 It took 7 years to complete because I kept putting it away until more inspiration struck or I found more fabric or another block I wanted to try. 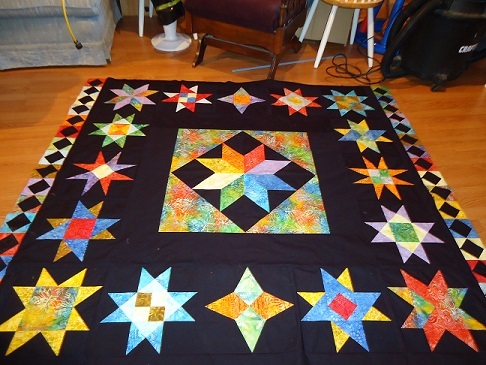 It is an oversized king and the border is paper pieced double flying geese. My favorite is called Scrap in a Box. 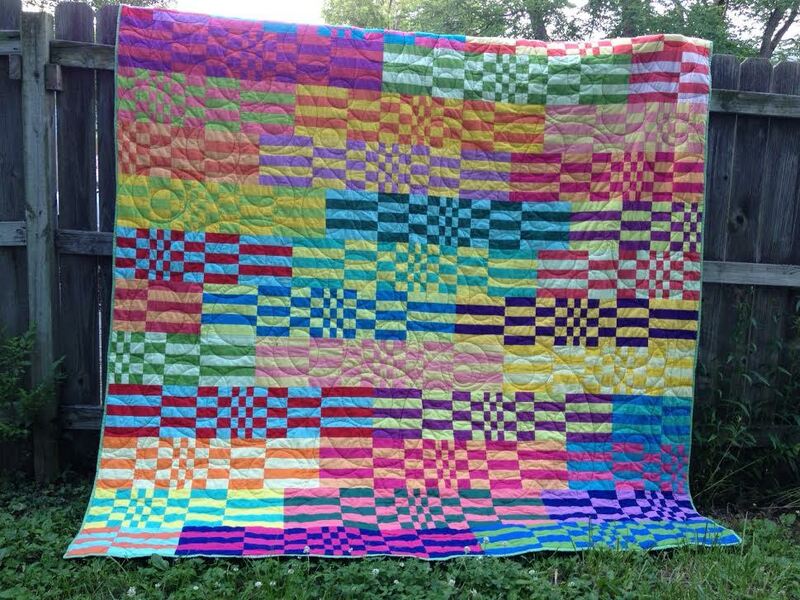 It is a mystery quilt by Charlotte Hawkes. I went even scrappier than the pattern called for. 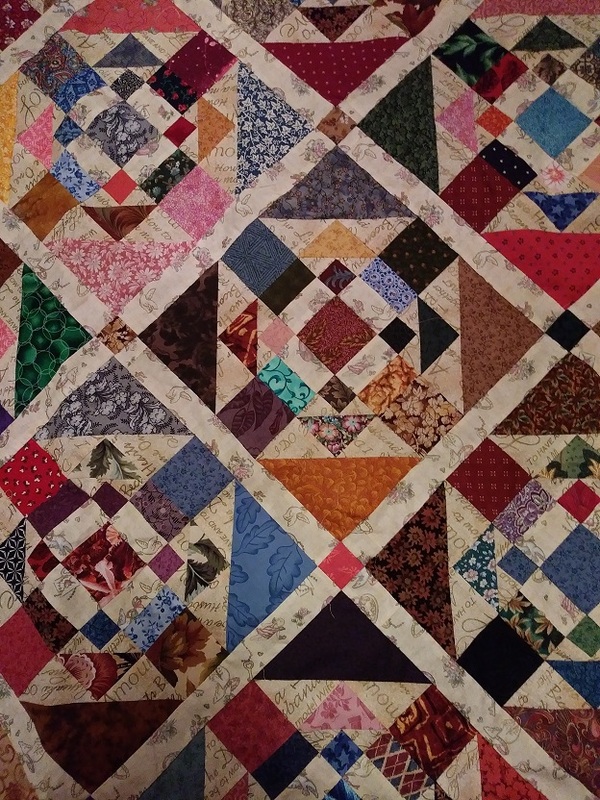 It was the first quilt that I completed after taking a years long hiatus from quilting, and it was the quilt that made me realize that scrappies are really what I want to make. 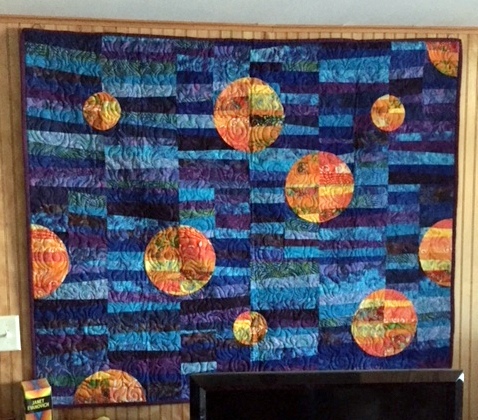 There are two unfinished quilts that I would have to say are my all time favourites (so far), but for finished quilts, I have to say this newest collage is one I can stand back and say: "I did that. I didn't think I could and I did it." GingerK... Gracious! 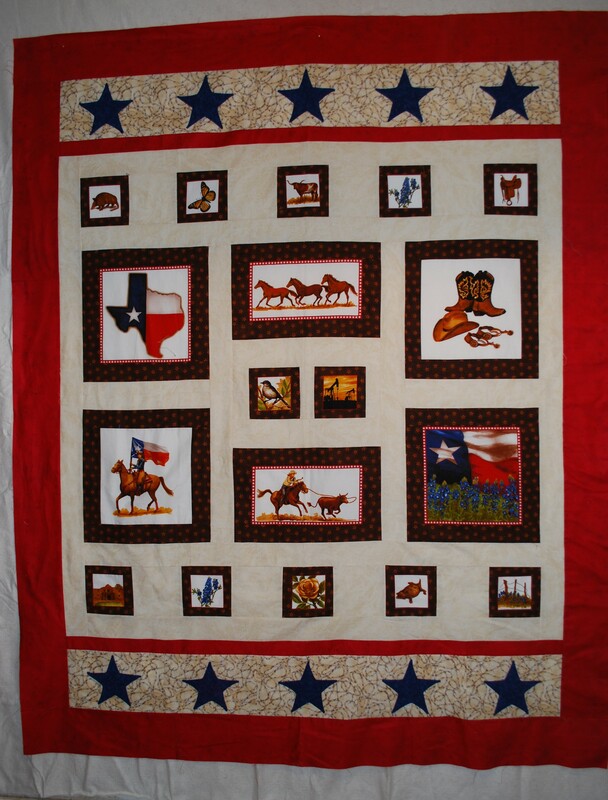 the border alone would make me think twice....the quilt is beautiful! Watson...that is FABULOUS!!!! I might try something small some day...just to see if it's my "cup of tea". Sure love it! 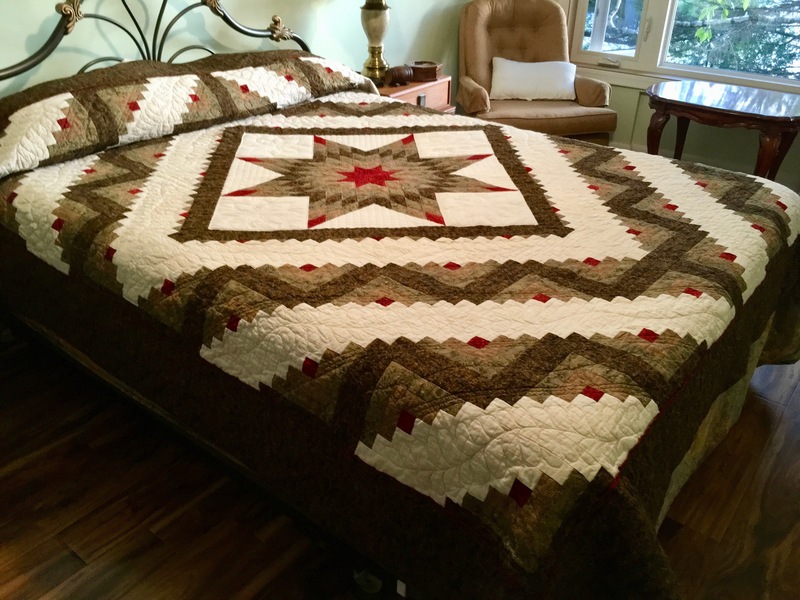 I like all my quilts but, don't have pictures of all of them. Here is one I made for a Granddaughters' friend when she got married a few years ago. I love the colors. This is one of my favorites. It's Shakespeare in the Park. I don't think I have a favorite though but this one is up there. 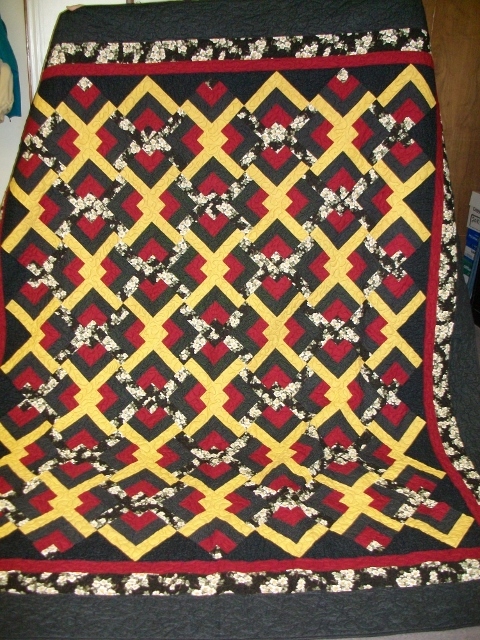 Unfortunately, this is before quilting. 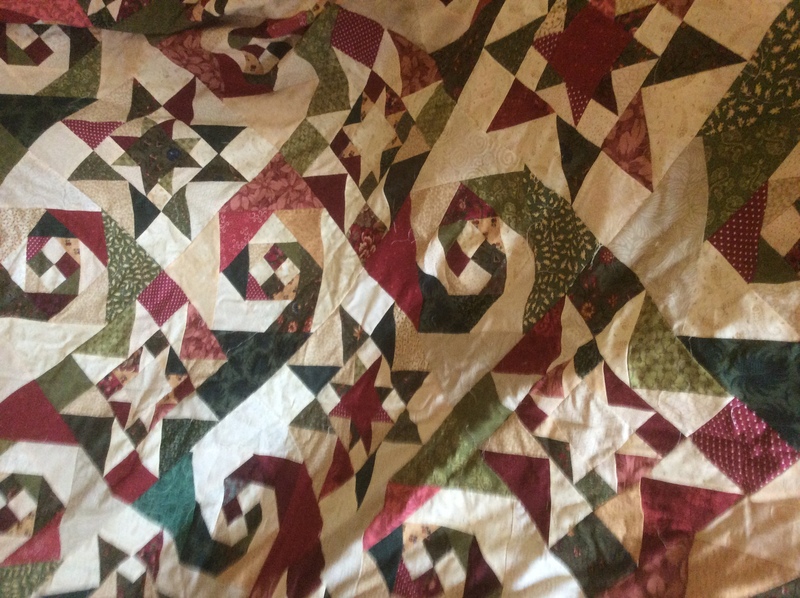 I can't believe all the gorgeous quilts I'm seeing!